For full coverage of everything you need to know about Public Relations and communications. 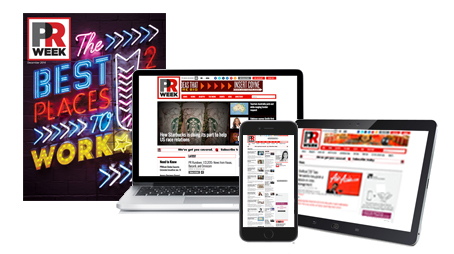 PRWeek is the leading resource for the PR and communications industry across all platforms, providing relevant and informative content that spotlights the top trends and thought leaders defining our industry. Credible, comprehensive, and compelling, we combine insightful and unbiased expert commentary and analysis, rigorous news gathering and market-leading events to help your business keep up with the ever-changing PR and communications landscape more efficiently and effectively. Subscribe today and be a part of the PRWeek global community. *As part of this special offer, your subscription will automatically renew every 3 months. Be the first to know. Sign up today.